Home Opinions	Pro vs Con: Is cellular service in the metro advantageous or not? Pro vs Con: Is cellular service in the metro advantageous or not? 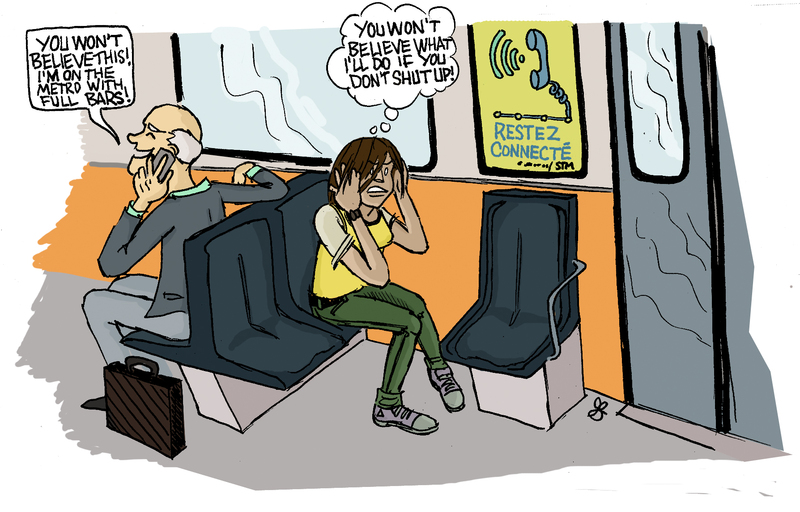 The STM recently confirmed that negotiations are underway to bring cellular service throughout Montreal’s metro system by the end of 2013. Currently, the STM only offers coverage in a handful of stations. But it has no plans to extend Wi-Fi coverage (which is limited to the 747 Express) over the bus lines. It is time for the STM to step up their game. Montreal has the third busiest public transportation system in North America (after New York City and Mexico City). Despite receiving the 2010 award for outstanding public transit system from the American Public Transportation Association, Montreal’s transit authority has lagged behind other cities on numerous fronts, including technology. Back in 2007, the KT Corporation started offering wireless coverage to all areas of Seoul, South Korea, including the city’s subway lines. The STM would benefit by following the South Korean model; the latter enjoys some of the fastest Internet speeds and lowest prices in the world. Wireless coverage would provide an extra incentive for riders to join the STM’s initiative to go green. Why drive to work when on the metro, you can plan your day, update your calendar, collaborate on that presentation or submit a paper you have due? For the cellular coverage that’s already planned, the new service would provide an apt communication system should an emergency take place in the metro. If, for example, a blackout occurs, users could contact authorities and give a clearer picture of the situation. While there are many advantages to more connectivity, some detractors have suggested that it would lead to a rise in theft of electronic devices. An increased police presence (which is already in effect) would help curb this, as well as the education of users. Others have said that the number of loud, noisy users on public transit would increase. However, the truth is that loud people exist regardless of the technology that is available to them. That is no reason to limit technological progress. I look forward to the day when the STM finally catches up with the times, offering Wi-Fi on its bus lines and making cell phone service available on the metro. Until then, I’ll still be playing Tetris and solitaire. Is there anything more annoying than having to listen to the conversation of a person sitting next to you on a bus as they scream on their cell phone, oblivious of the people around them? I don’t think so. The time spent on the bus or metro is the only time of the day to do absolutely nothing useful and put your brain on hold. Use that time to relax, clear your mind of negative thoughts, and listen to music. It’s not the time to make a dozen phone calls or Skype with your best friend in Australia. If Wi-Fi and cell phone service were offered on the metro, this would be the beginning of a nightmare. The situation on overcrowded buses, such as the 105 in NDG, is already painful enough. If I had to go through this on the metro too, I think I’d rather walk to school. Has our dependence on technology become so bad that people can’t even wait a few minutes between metro stops to check their emails or send a text message? This dependence can be dangerous, because the more time we spend on our phone, the less we spend actually interacting with other human beings. I am not an exception to the rule. I am as addicted to my phone as anybody else, maybe even more so. But unless there is an emergency, I never make phone calls on the bus, ever. I keep quiet. It’s just a matter of common courtesy. Phone calls seem to make people louder and ignorant of who is around them, and other people might not want to hear how their blind date with their friend’s cousin went. The time I spend in the metro is the only time when I can’t use my phone, and sometimes I wish there were more of those times.